The big Girls’ Day Out Show hits Glasgow this weekend! With a health, lifestyle, fashion, and beauty event that promises to be twice as big as last years, you Scottish ladies are in for a treat! 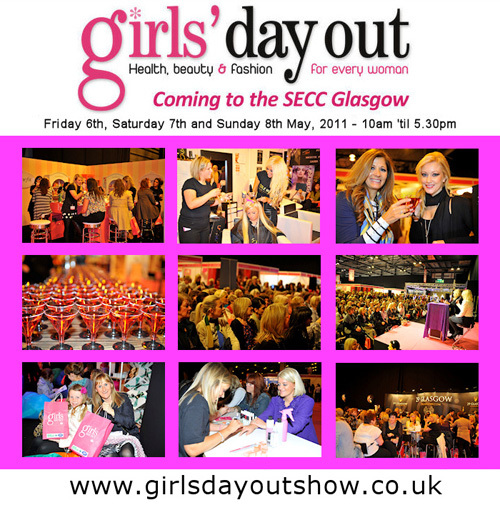 This year’s Girls’ Day Out Show in conjunction with No.1 Magazine is taking place from Friday 6th May to Sunday 8th May at the SECC in Glasgow so if you’re at a bit of a loose end this weekend, get your ticket booked today, they’re only £12 each! Will you be attending this year’s show? I am going… twice! so excited, there are so many stnad I want to ransack *i’m looking at you crown brushes* scared for my bank balance…. I definitely won’t be attending, but I’m jealous of the people who are. I wish! Had I known about this sooner I might have been tempted to go and have a cheeky weekend, shame it’s a bit late now. Hope anyone who is going has a fabulous time!